I messed up the back end of WordPress during a software update some months ago and I finally got around to fixing it. While the site “worked”, I couldn’t make any changes until I fixed it. The fix was actually quite simple and as usual I found it in the WordPress Codex. In the meantime, the folks at the BBC changed their streaming media format from Windows Media Player to MP3. So that meant that my “non-flash” links all became out of date. I’m happy to report that they’re now all fixed (as far as I know!). Just go to the BBC Radio section of this site. Of course I fixed my bookmarks file in my copy of Radio Tray first! The most helpful tool for figuring out the new links was the Mozilla Firefox web browser. It has some great built-in tools for figuring out this kind of stuff. Just go to “Tools”, “Web Developer” and then “Network”. You’ll have to do a quick reload of the page you’re viewing and then you can analyze the results to figure out where the audio stream is “actually” coming from. So my copy of “Radio Tray” is happy and I hope you are too! Enjoy! “Radio Tray” – The best streaming radio software around! I first started listening to “exotic” radio stations from far away as a kid. First, listening to out of town hockey games and Top 40 radio from across the country on the AM radio band at night. Then later into my teens and twenties I began discovering radio stations from around the world that I could hear on shortwave radio. Over the years I learned to build bigger and better antennas and acquired newer and better quality radios. In the 1990’s with the development of the web, radio streaming came along. It was pretty lousy at first because most of us were on dial up connections. But as we shifted to broadband, the quality of radio streaming improved and was soon good enough to stream video and is now (mostly) good enough to support high definition video! Internet businesses are being built on video and audio streaming. Of course there are also video and audio podcasts too! But mostly, I keep coming back to streaming radio. Video requires you to stare at a computer or TV screen. Audio doesn’t. You can do other things. Over the last decade and a half, I’ve used all kinds of software for streaming radio; both proprietary software run under Windows and free software after I made the switch to GNU/Linux. A few years ago, I discovered the “Radio Tray” internet radio software quite by accident. I installed Voyager Linux, a Xubuntu “re-spin” from France on one of my home desktop machines and discovered that “Radio Tray” was part of the default installation. Radio Tray is pretty much the solo project of Carlos Ribeiro from Portugal. I started playing with it and quickly fell in love with it’s simplicity, functionality and low usage of computer resources. Radio Tray is a software programme that comes from the old school thinking of “do one thing only and do it well”. So, it is not a complete audio management programme like Clementine that streams radio, aggregates podcasts, manages your music collection, plays and rips your audio CD’s. Radio Tray solely streams internet radio stations. It’s a very small programme that occupies very little hard drive space and uses very little RAM. That means you can listen to internet radio while you’re doing other things on your computer. Also it frees you from having to open up a web browser to listen to your favourite net radio, except of course if a station only streams using one of those cutesy flashplayer based “in browser” players. You can run Radio Tray on a fairly old computer. I’ve run it on fifteen year old Pentium III class computers and it doesn’t even break a sweat! If you have an old computer gathering dust, you can easily turn it into an internet radio. Radio Tray only runs on GNU/Linux. Sorry, but there is no Windows or MacOSX version available. Mind you, if you have an old Windows XP box you really do need to put an up-to-date, secure operating system on it anyway. Radio Tray will handle audio streams in the .PLS, .MP3, .M3U, .OGG, .ASX, .WAX and .WVX formats. It also handles streams that use the Microsoft Media Streamer (MMS) URL instead of HTTP. It does not handle .RAM (Real Player) or .QTL (Quick Time) formats, but hardly anyone uses them anymore so it’s no big deal. On any Debian or Ubuntu based GNU/Linux distribution, you can easily install Radio Tray using your package management software in about a minute. You’ll find that the authors of each distribution will have already “populated” Radio Tray with a dozen or so internet radio stations in a variety of genres. When you launch Radio Tray for the first time it places a little Radio Tray icon on your taskbar. You just go through the menus, and click on the station that you’d like to play! Adding stations and organizing them into folders is pretty simple. For example I’ve created folders for CBC-1, CBC-2, CBC Music, NPR, BBC, and ABC (Australia) streams. This is the screen where you add a new radio station to your Radio Tray bookmarks! 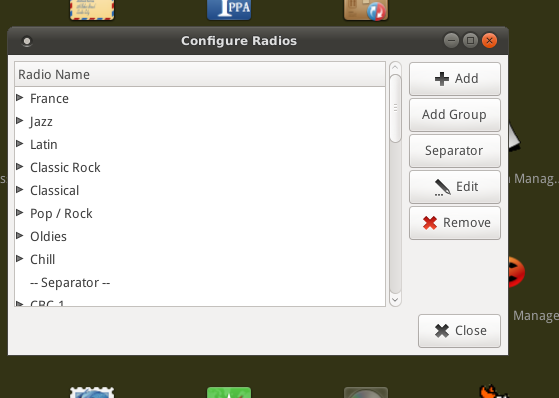 To add folders and new radio stations you just right click on the Radio Tray icon and go into “Configure Radios“. To add a station, you just copy and paste the URL of the audio stream you want to “bookmark” and then give it a name. Be careful not to duplicate a radio station name. I discovered this little problem when I had entered “Toronto” under CBC Radio One and then also tried to enter “Toronto” under my CBC-2 folder. It didn’t work! So I just called it “CBC2 Toronto” instead and it worked fine. After you’ve added some of your own stuff to Radio Tray, just right click on the Radio Tray icon in your taskbar, and click on “Reload Bookmarks” just to make sure that Radio Tray has accepted your changes. Of course I’m a little bit crazy and so my Radio Tray setup probably has a couple of hundred radio stations bookmarked! 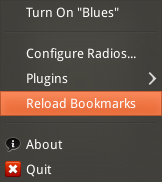 If you’d like to copy your Radio Tray bookmarks from one computer to another, it’s actually pretty easy. /home/yourusername/.local/share/radiotray and you’ll find a little file called “bookmarks.xml“. That’s the file you’ll want to make a copy of and copy to the same location on another computer. Of course if you copy a new bookmarks.xml file over to another computer, make sure to reload the bookmarks! So give Radio Tray a try. You might also grow to like little programmes that do cool things! 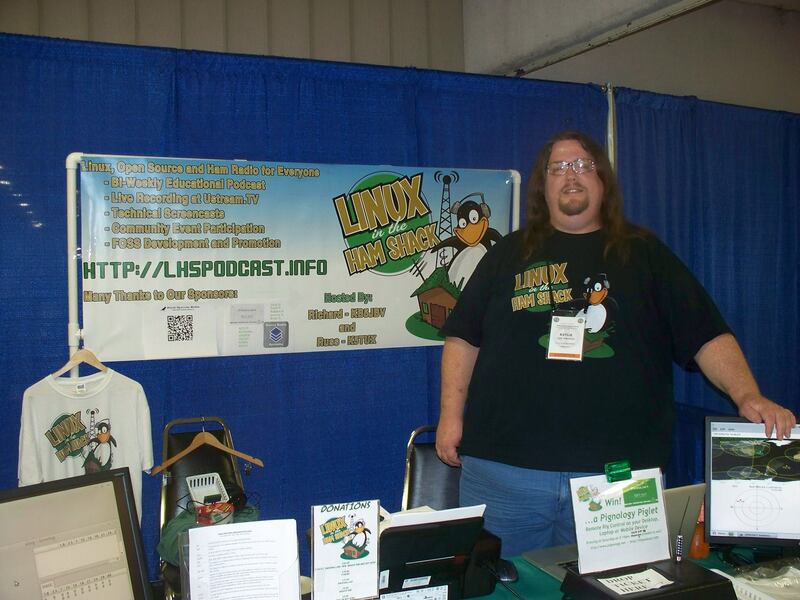 One of the more interesting podcasts I enjoy listening to is “Linux in the Hamshack”. The LHS podcast covers two geeky things that I have a love for, namely the world of free and open source software and my much longer geeky passion, amateur radio!. But of course the emphasis is mainly on free and open source software that’s used by ham radio operators. LHS podcast is hosted by Russ Woodman K5TUX from Arkansas along with Pierre Landy VE2XPL from just outside Montreal. This podcast doesn’t follow a super regular schedule, but the guys seem to get something out about once a month. Go visit their site and catch up on the backlog of episodes and watch for future episodes. You can of course subscribe to their podcast without iTunes in either .mp3 or (free media) .ogg format! A few useful things to pass on while I start updating this site. I’m currently catching up on some podcasts from “Jupiter Broadcasting“. What’s Jupiter Broadcasting? It’s a little tech podcasting empire created by Seattle based Chris Fisher. 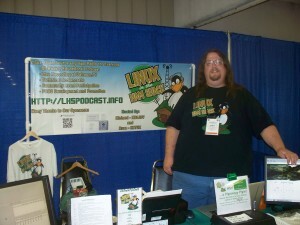 Fisher’s flagship podcast is of course the “Linux Action Show” which goes out every Sunday. They also have a more community-oriented spin-off podcast called “Linux Unplugged”. “TechSnap” focuses on computer system security news, while “Coder Radio” deals with software development. “Unfilter” is an often humorous look at the mainstream media. There’s also now a new daily podcast called “Tech Talk Today”. While they’re all available as video podcasts, I hardly ever watch them because it ties me to a computer or TV screen. I prefer audio because it allows me to do other things while I’m listening. What do I use to listen to the podcasts? Certainly not iTunes! My podcast aggregator of choice is Clementine Player. Clementine does everything that iTunes does, plus a few things that iTunes can’t do. Besides, it’s NOT iTunes! Clementine is cross-platform, available not only for GNU/Linux, but also for those of you still stuck in Windows and MacOSX land. Of course, I’m typing this post on one computer and listening to my podcasts on another computer; an old 2003 vintage IBM Thinkpad T40 laptop with 1 GB RAM. When I bought this computer used from a shop on Toronto’s College Street “Computer Alley”, it of course came with Windows XP installed on it. Making XP disappear was my first task once I got it home. Over the years it’s had a number of GNU/Linux distributions on it, but currently I’m using “SolydX“, a Debian based distribution from a group of folks in the Netherlands that uses the lightweight XFCE desktop. Since most of the computers I run around the house are a little on the old side, I prefer GNU/Linux distributions that use either the XFCE or LXDE desktops. Doing things this way means that computers that other folks consider yard sale candidates I find perfectly functional and usable.